Red Bull Mobile's flugtag has lost its wings and is about to crash in Australia - though slowly, and not quite dramatically. The mobile virtual network operator (MVNO) is seemingly exiting the Australian market, announcing on its homepage that it will no longer be signing up new customers. 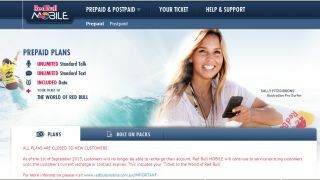 "As of 1st July 2013, new customers will no longer be able to purchase pre-paid or post-paid tariff plans from Red Bull Mobile," the company posted on its website. "Red Bull Mobile will continue to service existing customers until the customer's current recharge or contract expires," it said. It added that these customers will still have access to all of Red Bull Mobile benefits up until the end of their contract or recharge as well, including access to its mobile portal, tickets to events and merchandise. The Red Bull branded MVNO launched less than two years ago, using Vodafone's network and offering competitive postpaid and prepaid plans. Its 365-day plan, which required a one-off fee of $365 for unlimited calls and 5GB of data a month for the year, means that Red Bull Mobile may finish up servicing its last customers up until mid-next year at the latest. As to why the company decided to pull out of the Aussie MVNO market, it only had this to say on its website: "With the prevalence of 'open' mobile platforms in Australia, Red Bull is taking this opportunity to focus its marketing efforts on existing and future digital assets to allow an even greater number of consumers to access the World of Red Bull through their own mobile device." But while Red Bull Mobile's run of energy will be going the way of Crazy John's (another Vodafone MVNO that shut down in February), Kogan Mobile, Boost Mobile and Aldi Mobile have launched their own MVNO flugtags just this past year.